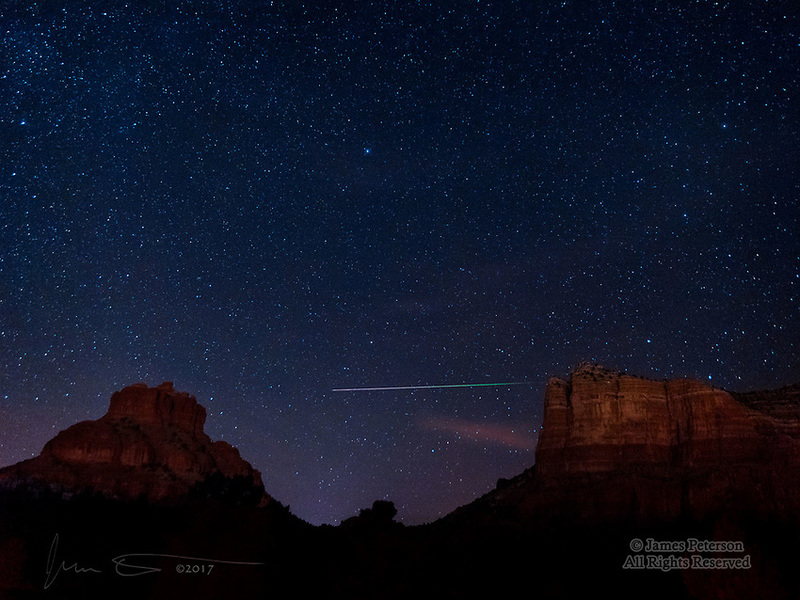 Leonid Meteor over Bell Rock Vista ©2017 James D Peterson. During the 2017 peak of the Leonid Meteor Shower (Nov. 17-18), I went out around midnight for a two hour photography session. I captured several meteors in that time, but this one was by far the best. It moved from east to west (right to left in this image), and it's interesting to observe how the color of its glow changed as it penetrated farther into our atmosphere and ultimately vanished as the last of its mass vaporized. Bell Rock is on the left, and Courthouse Butte is on the right, and Polaris (the North Star) is the bright star towards the top center. The rocks are dimly lit by the lights of the Village of Oak Creek, where I live.